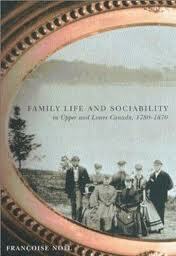 In this case, the book’s title tells you exactly what the book is about- family life, sociability and Upper and Lower Canada. Because my research interest is Upper Canada, and for such a limited period of time (i.e. 1827-9), I’ve tended to restrict my reading as much as I can to that small canvas. I haven’t really explored Lower Canada (i.e the French-speaking part) at all. This book, which draws on diaries and letters as its source material, straddles both the Upper/Lower Canada divide. Its focus is on family and social life, which are not constrained by political borders and so I am venturing into new geographical regions in this book! The diaries she uses are mainly general records of daily activities, including visits received and made, family and community events, daily work and weather. They are the sort of diaries that often pass off the details under the terse phrase “the usual”. There’s not a lot of introspection in them, and they focus more on the social than the individual. For the individual focus, she turns to family correspondence, which became increasingly important in the 19th century as part of the rise of the middle class, heightened in the case of Canada by the waves of migration and distance. Letters were the key to maintaining family links, exercising patronage and sharing family culture and information. Again, they were not necessarily personal confidences, as they were often handed around the family. Although she did not consciously limit the study to any one social group, the nature of the sources resulted in a bias towards writers with more education and the ability to write. She also draws upon portraits of the period, but this too leans towards those with the wealth to either encourage drawing and sketching within the family, or to commission portraits commercially. The book is organized in three parts. Part I, ‘The Couple’ takes a chronological life-stage approach, starting with courtship and engagement, moving to marriage, housekeeping and married life. Part II ‘Parents and Children’ traces childbirth and infancy, childhood, and parent/child relationships as children approached adulthood and started the cycle again. In this regard, the book reminded me of Amanda Vickery’s Behind Closed Doors: At Home in Georgian England. Noel highlights those aspects which reflect specifically Canadian conditions: the ready availability of land for all children which influenced English hereditary patterns more tailored towards preserving a limited estate for the eldest son; the shortage of women; the frequent absence of husbands; and distinctions between English advice literature on childrearing appearing in the newspapers and the ‘Republican Motherhood’ ideal being promulgated in the nearby American states. The degree of socializing is startling- constant coming and going, visiting, staying over for weeks and months. New Year was particularly important- more so than Christmas- and social activity focused on the Jan-Feb winter season. It is strange to my Antipodean sensibility to think that you would deliberately choose to socialize during the coldest, most snow-bound time of the year, and that snow made transport easier through sledding across a smooth surface rather than more difficult along unmade roads. Otherwise, though, social life amongst the elite seems fairly similar to that in Australian colonies – subscription balls, governors balls, picnics, fairs, horse racing, sermons. But the extended family was central to this sociability, and in this, I suspect, Australia and Canada differed, at least in the early years of Australian free settlement. Siblings might travel out to the Australian colonies in pairs, or one by one to join their family already here, but networks of cousins, aunts and uncles developed gradually. The injection of single-male travel to Australia through the pastoral industry and later the gold rush deferred the highly complex integrated family pattern found in Canada for some decades.There are extended families In Australia of course, but in comparing 1840s Canada and 1840s Australia, family connections and sociability seem much stronger in the former. The author is largely content to let the writers speak in their own words, and there is not a great deal of theorizing in this book. I was interested in this book to see how Noel would deal with her informants. She introduces the main ‘characters’ early in the introductory chapters, especially in establishing their identity as discrete families with their own family trajectory, interspersed generously with portraits then and there (rather than saving up for an insert later in the book). It surprised me a little that in the closing chapters she seemed to backfill on the Papineau family in particular, who to my reading, seemed very well established earlier in the book. For other, smaller family groupings, I found myself wondering “Hold on? Have I met this person before?” A very good index, which not only listed the family, but also life-stage details (e.g. marriage, children) and page numbers, helped to re-establish the family in my mind when I’d forgotten them. She also has sources that are particularly useful for one particular theme (e.g. childbirth) but who provide little information in relation to her other themes. These informants tended to star in one or two sections, but then disappeared from sight entirely. I found myself wondering what happened to them. The portrayal of life-story and wider sociability that she stitches together here is so rich that I found myself forgetting that , by her own admission, many of the diaries especially that she dealt with are rather humdrum documents. Here she has the advantage of being able to range over several sources, picking the eyes from them. In this regard I envy her- when you are focussing on an individual you have to content yourself with the documents you actually have (terse, scrappy and incomplete though they may be), rather than the full and densely informative ones you crave. Edmund is, after four years hard labour, convinced that nothing is to be done by Farming in Canada; the land here produces too little to pay the labour requisite to cultivate it. Lucy’s diary has been published as Love strong as death: Lucy Peel’s Lower Canadian Journal 1833-1836, edited by J. I. Little (2001). It was written as a “letter diary”, where she recorded the letters that she sent as monthly instalments to her mother and occasionally to her sisters and in-laws. Her husband Edmund also contributed a few letters as well. The letters survived as transcriptions in three bound volumes titled “Letters from Canada” and the transcriptions, written (and possibly culled?) in two different hands, were donated to a university archive by a great-great-grandson. As such, it should be seen as a series of letters rather than a journal as such, and subject to the qualifications about letters discussed and commented on previously by Hels and Yvonne. My interest is in Upper Canada, and at this stage I am not sure how much the mindset in terms of social expectations within the English community differs between Upper and Lower Canada. Of course, the French presence in Lower Canada was a major distinguishing feature between the two provinces. Little notes that English gentry preferred Lower Canada to the more sparsely populated Upper Canada, which was afflicted with cholera and malaria. (In my total ignorance of Upper Canadian climate at this stage, the reference to malaria surprises me.) Peel, at least in the excerpts and article, does not make much comment on the French at all, but she does describe the English community and expresses some fairly virulent anti-Americanism, and I would expect that similar sentiments would apply in Upper Canada as well. The excerpts reveal a lively, perceptive letter writer, and their marriage seems to be a loving one. Little uses Vickery’s book The Gentleman’s Daughter as a thematic touchstone for describing Peel’s writings and identity as a gentlewoman on the frontier : love and duty; fortitude and resignation, prudent economy, elegance, civility and vulgarity, and propriety. Move over, Lucy- I think I’m a bit in love with him myself!